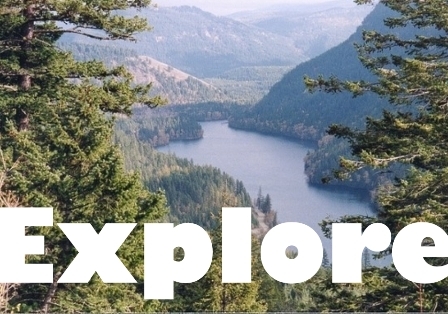 Wild teas, medicinal, culinary and craft accents made from the wilds of British Columbia’s mountains and forests. Our wild herb, fruit and berry flavoured tea blends offer a unique full bodied taste that exemplifies the British Columbia wilderness. Each herbal tea is designed specifically to assist the body in healing and stress relief and considers ancient wisdom associated with the culinary and healing arts. 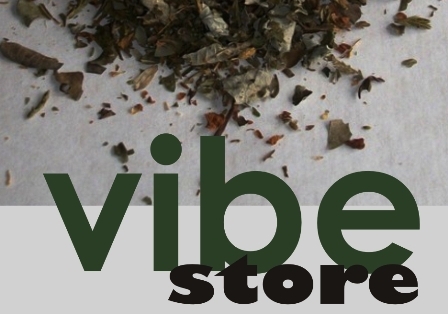 We are a specialized provider of organic, non-GMO and wild crafted herbal tea blends to practitioners and the retail sector. We hand mix and hand pack on our own premises located at our Wild Tea Plantation, delivering you a quality product every time. Our products are free from dust, chaff, powder and fillers. Our teas do not include any stabilizers, colourings, artificial flavours, additional sweeteners, preservatives or synthetic chemicals. Preparing wild herbal tea is an art form and becomes unique to each tea or tisane blend. Within this bottle is a natural mint stem which is used to pull the tea out of the bottle. Place 1-2 heaping “tea”spoons of tea per 8 ounces of water into the bottom of a teapot and then pour boiling water over the tea. Allow it to steep for 5 minutes or more. Longer steeping times make for stronger tea. But it also makes for a more bitter tea. If you want stronger tea, increase the amount of tea you use, but you may not have to allow it to steep longer. When the tea is steeped pour the tea through an infuser or straining device into a cup. Now you can begin to experiment with natural sweeteners or other taste infusions; or simply enjoy the blend on its own and the subtle uniqueness of British Columbia’s wild places. makes approximately 150 cups of tea. As wildcrafters we create tisanes within a dedicated promise to protect and restore Planet Earth. Learn about how we are trying to rewild cafes - visit our “Vibe Page”. 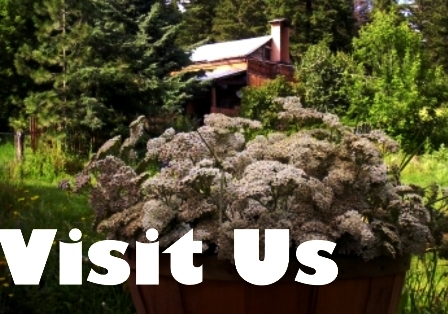 You can also visit a collection of fine locations that carry our products and support our mission. At the Wildcraft Forest our artisan loose teas are prepared in limited editions with every bottle or package numbered and signed and then displayed with an original label designed in our studio. A great product line for giftshops, cafes and specialty retail outlets. Our Wildcraft Forest artisan loose teas are prepared in limited editions with every bottle or package numbered and signed and then displayed with an original label designed in our studio. Our wild herb, fruit and berry flavoured tea blends offer a unique full bodied taste that exemplifies the British Columbia wilderness. We are a specialized provider of organic, non-GMO and wild crafted herbal tea blends to practitioners and the retail sector. We hand mix and hand pack on our own premises, delivering you a quality product every time. Our teas do not include any stabilizers, colourings, artificial flavours, additional sweeteners, preservatives or synthetic chemicals. 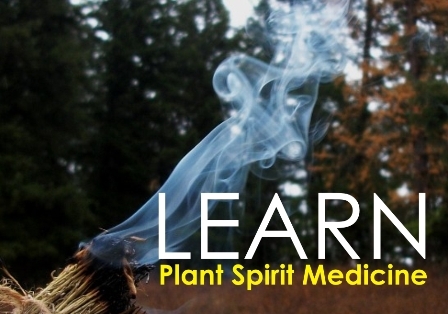 Take in the forest atmosphere, enjoy great wild tastes and plant your forest. Yasei Shinrin Yoku is Japanese for “Wild Forest Bathing” and means "taking in the forest atmosphere". This wildcrafted tisane is made from botanicals found in British Columbia’s remote forests, which are like a super multivitamin that provides us with all sorts of the nutrients we need to live healthy lives. Forests and nature can protect us from all these different kinds of diseases--cardiovascular, respiratory, mental health, musculoskeletal. 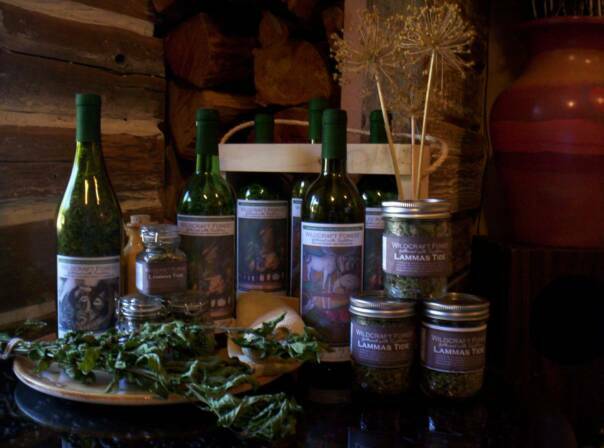 Our tisanes are carefully harvested and then blended at the Wildcraft Forest where we seek to provide you with wild life-force that includes essence, energy and spirit. Inside each unique package is a wild "seed guild" that allows you to plant and propagate a forest and become a "wildcrafter". Off-set your coffee with this wild tisane/coffee mixer. 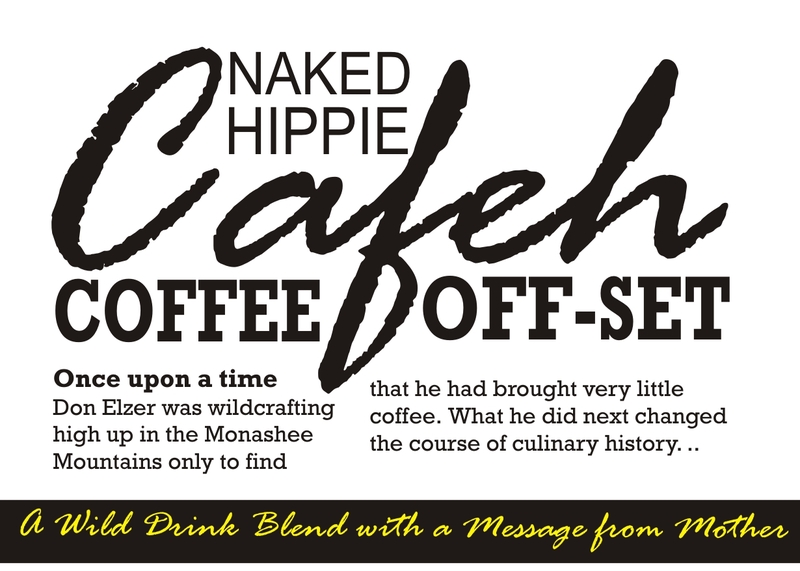 Our Naked Hippie Cafeh Editions are wild tisanes that are uniquely designed for mixing with your favorite coffee. Mix this loose tisane with coffee and apply the blend to your coffee maker; run pure water through and wow! You will experience a fruity coffee flavour that makes for a great evening cuppa. It’s a great way of cutting your caffeine intake while experiencing your own “wild” self. By easing back from our reliance on globalized coffee trade you help us advocate “coffee offsetting”. You can order your Cafeh blends packaged in either a nostalgic stubby beer bottle or in a bag – either way each package in includes a “Message from Mother”. 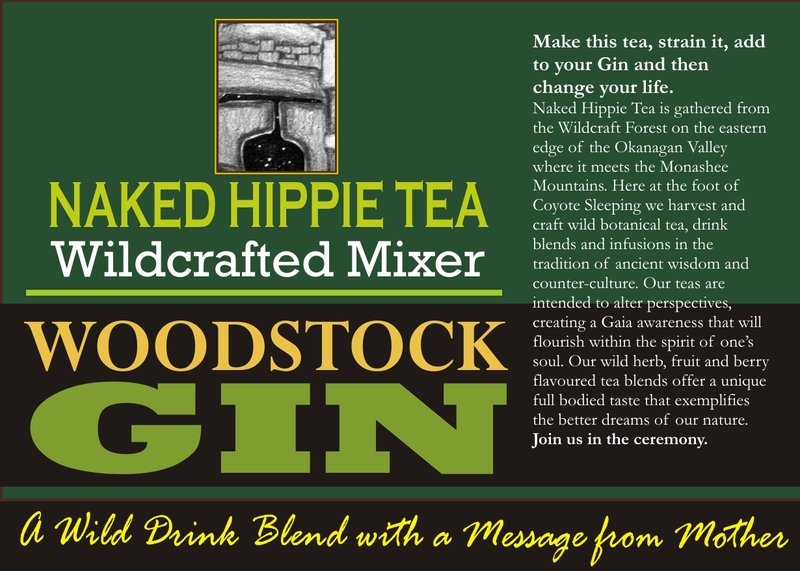 Look for our “Woodstock Gin”, “Righteous Whiskey” and “Rebel Vodka” wild cocktail blends. Naked Hippie Tea represents a family of wild cocktail mixers specially designed for creating alcohol or non-alcohol chilled beverages. Make your tea and then chill it – then infuses it with your favorite spirit. You can also skip the alcohol and infuse it with your favorite fruits. We also make “Naked Hippie Wild Beer Bags” – simply insert the tea bag into your favorite glass of cold beer…and let the wild magic begin. Naked Hippie is about “counter-culture” and breaking all the rules enroute to great wild tastes that support you as the artists. You can order Naked Hippie blends in either glass bottle or paper packaging that includes a “Message from Mother”. The Wildcraft Forest offers a special “Server Program”. Whether you operate a tea house, café, restaurant, or pub we can provide you with great tools that will help you add our products to your menu so that you can join the “wild vibe” and grow a whole new customer base. 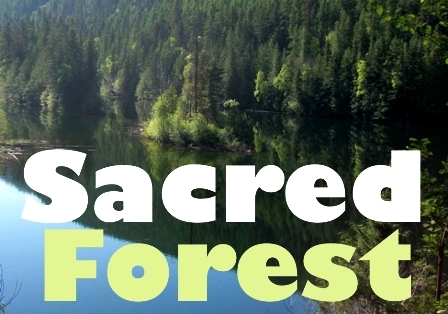 Here’s where you can find Wildcraft Forest Tea. We’re eager to find more locations for Wildcraft Forest tea. So if you frequent a café, or tea shop…put in a good word for us…when you buy a cup of Wildcraft Forest you change the world…for the better.